Are you ready for the Party for Preservation?” What better way to cap off Earth Day than watching the sunset over Weeks Bay while enjoying fresh local seafood and listening to awesome local music for a great cause? The 10th annual Bald Eagle Bash, set for May 4 from 4-7 p.m., at the Tonsmeire Weeks Bay Resource Center, is the Weeks Bay Foundation’s largest event, raising funds to restore vulnerable coastline, protect wildlife and educate folks about how they can help ensure we have clean water. This “taste of Weeks Bay” brings more than a dozen area restaurants together to create dishes based on delicious Gulf shrimp. From fried shrimp, to stuffed shrimp, to shrimp and grits, shrimp ceviche, and jalapeno shrimp sliders, each chef prepares a signature dish that is sure to delight all participants. And while seafood is the main attraction, the local music is always a big draw. This year’s awesome music features the super-popular Red Clay Strays! From the far reaches of rural south Alabama, The Red Clay Strays claim their unique sound with a humble confidence that can only come from their upbringing. This band, on stage and off, reminds you of southern music’s heyday and gives you hope that it may not have lost its way after all. Growing up listening to gospel along with artists such as Waylon Jennings, The Eagles, and the Allman Brothers, their wide range of influences create a combined style of the country music and southern rock we’ve all been waiting for. Lead Singer, Brandon Coleman, with vocals that bring to mind young Elvis, is the heart of their high energy show along with Drew Nix on rhythm guitar, Zach Rischel on lead, Andrew Bishop on bass and John Hall on drums. The 2018 Bash featured 16 restaurants, a great selection of wine and beer, and more than 1,200 fun-loving people! Closer to the event, tickets will be available through this website and at several local outlets. Tickets are $45 in advance and $50 at the gate. Children 10 and under are free. Free parking is available at the Weeks Bay Foundation site, with shuttles providing transportation to the event. 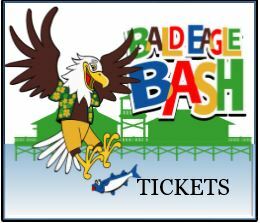 For more information about the event or to be a sponsor, please call 251-990-5004, visit www.baldeaglebash.com or visit us on Facebook.